According to Unilever's North American eCommerce head Doug Straton "Consumers trust current users of a product more than something a brand may put forward through traditional assets,”. 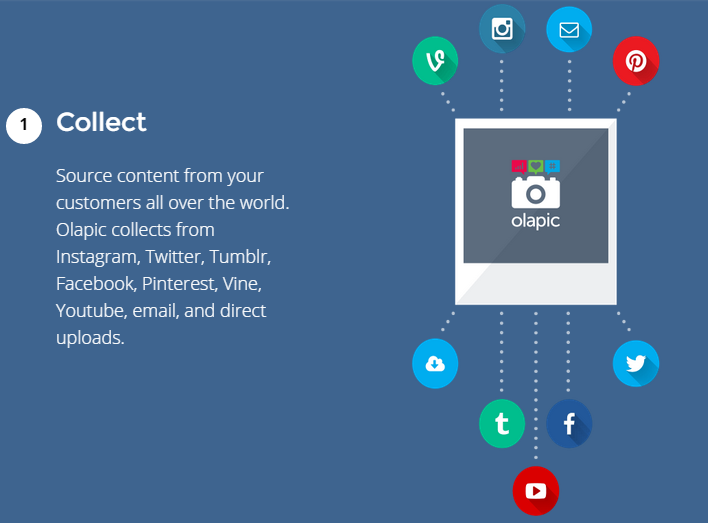 By sharing the content with four sites—Ulta.com, RiteAid,com, CVS.com and HarmonDiscount.com—more consumers are exposed to that content. 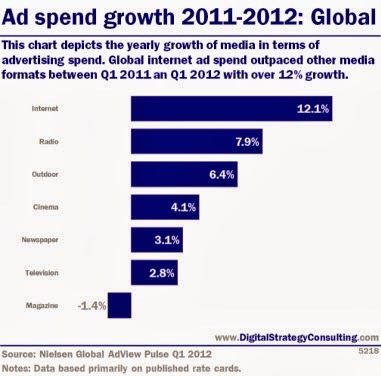 Until a few years ago most companies looked at online as yet another platform to air their TV commercials. This is not the case any longer. FMCG companies are looking at digital media as a separate platform to engage with their target audience. Perhaps the most successful digital campaign in the country by an FMCG company has been run by Hindustan Unilever (HUL). The consumer goods giant last year launched a free mobile radio entertainment channel called Kan Khajura Tesan, which can be loosely translated as Centipede Station, in Bihar and Jharkhand. To access the content, a mobile phone user gives a 'missed call' - the call here gets disconnected automatically after two rings - on a given number. The user is then called back and gets to listen to songs, jokes and, of course, HUL advertisements. The idea behind the campaign was to reach out to consumers who do not have access to TV, radio or the print medium but have a mobile phone. Over the past seven months the radio station has reached out to more than nine million subscribers and HUL ads have been heard 85 million times, the company says. HUL now plans to roll out the channel in other regions. 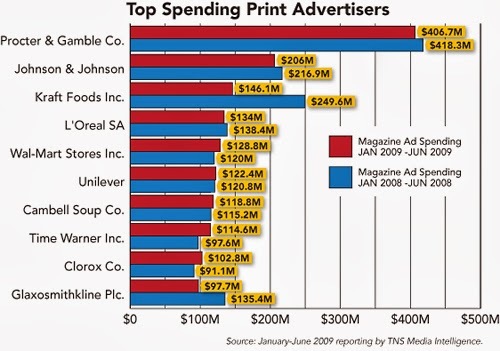 Consumer Goods brands have traditionally been big spenders on TV and Print.. 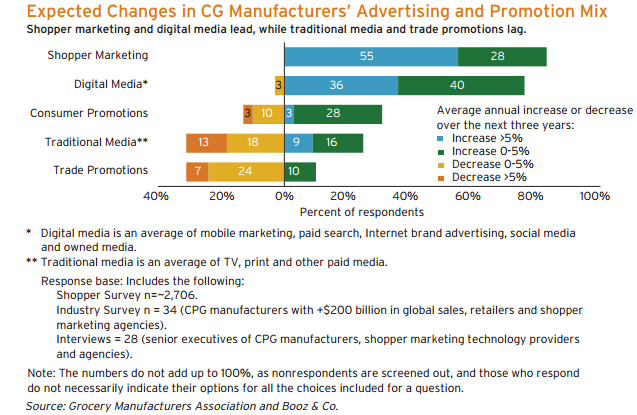 However that start changing from 2011 onwards, when CPG brands started moving online.. and very soon Procter Gamble, Unilever, Colgate, General Mills started to see amazing results as they started reaching consumers at a fraction of the cost what they did earlier.. With Mobile web Procter and Ganble could have access to consumers via video.. which could be played " with amazing clarity and faster"
Using impressions rather than clicks to measure digital campaigns was far more predictive of real-world results and increased the estimated ROI of Facebook advertising by as much as 75%, according to Ross Link, Nielsen's president of global marketing return on investment solutions. L'Oreal, the world's third-biggest ad spender behind P&G and Unilever, is set to increase their digital budgets upwards from 12% .  Last year 20% Loreal sales came from onlineGeneral Mills has almost doubled their digital marketing budgets from 8% in 2008 to 17% in 2008 Currently 79% of their ad dollars are spent on TV. 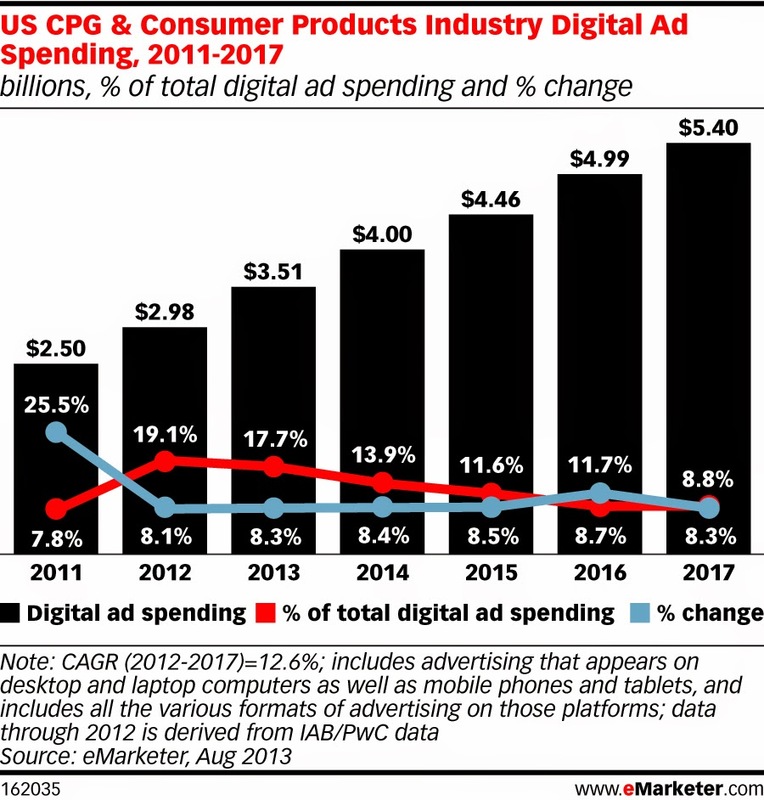 Executives of Procter & Gamble Co. and Mondelez International both said their companies now spend about a quarter of their U.S. media budgets on digital and plan to keep growing that share as they see improving return on investment. P&G's global brand head ,Marc Pritchard had recently explained about how it has shifted its mindset to “digital back” - campaigns that start in the digital world and build back into the rest of the marketing mix. 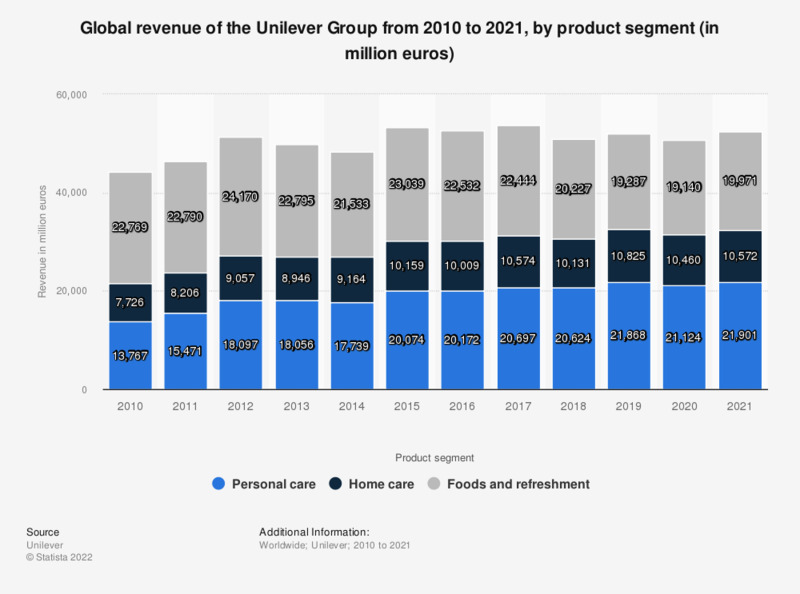 P&G has previously said that is spends around 35 per cent of its US media budget on digital but has not released a figure for the business overall.. 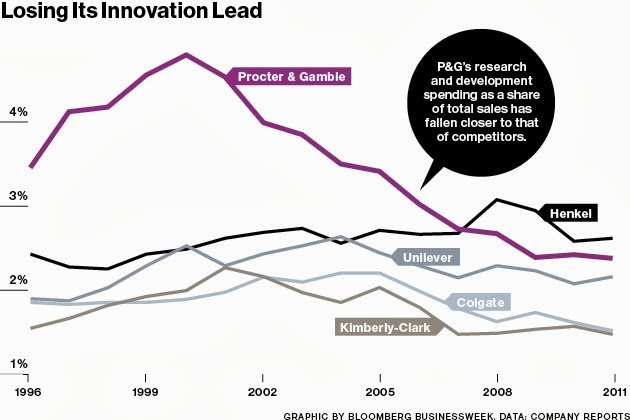 The focus on marketing efficiency comes as P&G, which owns Olay, Pantene and Duracell, saw declining last quarter with .PG revenues were up by mere 5%YoY to $22.28bn, down from 2 per cent growth in the previous two quarters. Profits were down almost 16 per cent to $3.43bn.